Actor Tom Holland appeared with Robert Downey Jr. on Facebook Live to make the announcement. Grab your web shooters and stifle your Spider-Sense. Marvel has announced that Spider-Man will be making an appearance in its 2018 superhero sequel “Avengers: Infinity War.” The news was revealed this afternoon by actor Tom Holland, who dropped in on a Facebook Live event hosted by Robert Downey Jr.
Holland’s appearance in the Russo brothers-directed film isn’t entirely a surprise. “Infinity War” already boasts a super-sized roster of Marvel MVPs that includes the cast of “The Avengers”, Benedict Cumberbatch’s Doctor Strange, Josh Brolin’s villain Thanos, the “Guardians of the Galaxy” cast, and more. “Guardians” star Chris Pratt also appeared on Downey’s Facebook Live feed this afternoon to confirm he’ll be in the film, though his involvement with “Infinity Wars” has been known since April of 2016. Holland debuted as the Marvel Cinematic Universe’s Spider-Man in 2016’s “Captain America: Civil War,” and he’ll reprise the role this July in “Spider-Man: Homecoming”. The specific plot details of “Avengers: Infinity War” have not been disclosed yet. However, it is known that Brolin’s Thanos will serve as the film’s main villain. In the comics storyline presumed to serve as the inspiration for the film’s plot, Thanos seeks to control several cosmic relics called “infinity gems” that will give him the power over life and death for the entire universe. Directed by Anthony Russo and Joe Russo, “Avengers: Infinity War” was written by Christopher Markus and Stephen McFeely. The official trailer for "Spider-Man: Homecoming" has hit the Internet. 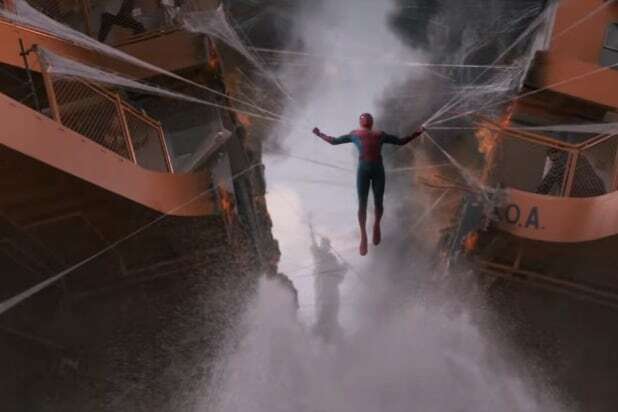 While a few things were spelled out plainly -- the comedy, the slice of life feel, and the classic coming-of-age Spidey story -- the trailer was also filled with less obvious moments that seem to reveal a lot. Let's take a look. Donald Glover's role in "Spider-Man: Homecoming" is still a closely held secret, but he very briefly showed up in the trailer alongside this guy testing out what we assume is one of the Tinkerer's weapons. It feels likely, then, that Glover is playing one of the bad guys. The Tinkerer -- a sort of sub-villain who makes weapons and equipment for bad guys -- seemingly will play a big role in "Spider-Man: Homecoming," judging by the frequency with which weapons that look like the kind of things he would make appear in the trailer. There's this one that bank robbers use to pull an ATM out of the wall, the grenade launcher-looking think a goon is using with Donald Glover and an energy weapon wielded by the movie's real big bad, Vulture. The "Spider-Man: Homecoming" trailer has arrived just in time to be thrown up in front of "Rogue One: A Star Wars Story," which tells the tale of rebel freedom fighters and their quest to steal the plans for the Death Star. And, interestingly enough, the trailer sees Peter Parker's best friend Ned Leeds (Jacob Batalon) droppping a LEGO Death Star in reaction to seeing Peter climbing upside-down. Ouch! That’s some expert-level corporate synergy on Marvel’s end. Tony Stark serving as more than just a mentor in the movie -- it looks like he’ll be suiting up for battle alongside Spidey as well. The trailer wraps with a shot of them taking to the sky, and if Tony’s suited up, it likely means that this isn’t just for funsies -- looks like we'll be getting some legit Iron Man action here. Time for a field trip! 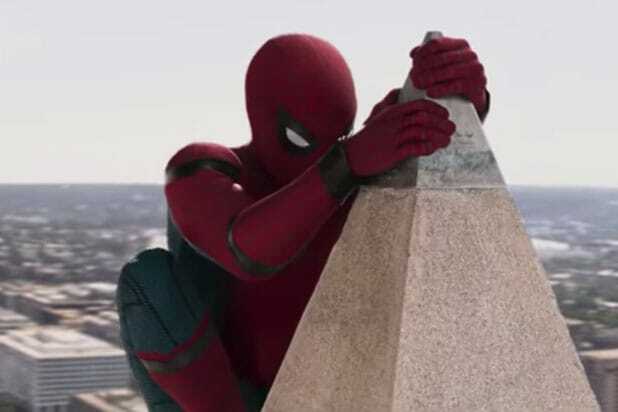 But, of course, nothing ever goes smoothly for ol' Peter Parker, and it looks like what could have been a chill trip to the Washington Monument in Washington, D.C., ends up turning into a major set piece. Behold, the wingsuit, which Spidey gets to show off on the previously mentioned field trip. Tony Stark stepped in to help his protege with an all-new (but only slightly adjusted) look. Familiar webbing stretches forward to give our hero that extra aerodynamic edge he needs to take a leap and websling his way around New York. This is the first time we've seen this look on screen, but it's appeared in several iterations of the costume before. Web-wings are a common addition to most major Spider-verse costumes, including Silk's and Spider-Gwen's. We get a glimpse of a showdown between Vulture and a maskless Spidey on the beach at Coney Island -- which makes us think this glimpse may be of the climactic showdown.